1> Chuck Norris' tears cure cancer. Too bad he has never cried. 2> Macgyver can build an airplane out of gum and paper clips, but Chuck Norris can kill him and take it. 3> Chuck Norris doesn't read books. He stares them down until he gets the information he wants. 4> Chuck Norris's girlfriend once asked him how much wood a woodchuck could chuck if a woodchuck could chuck wood. He then shouted, "HOW DARE YOU RHYME IN THE PRESENCE OF CHUCK NORRIS!" and ripped out her throat. Holding his girlfriend's bloody throat in his hand he bellowed, "Don't with Chuck!" Two years and five months later he realized the irony of this statement and laughed so hard that anyone within a hundred mile radius of the blast went deaf. 5> Chuck Norris has never blinked in his entire life. Never. 6> There is no 'ctrl' button on Chuck Norris's computer. Chuck Norris is always in control. 7> Apple pays Chuck Norris 99 cents every time he listens to a song. 8> Chuck Norris can kill two stones with one bird. 9> Chuck Norris is the reason why Waldo is hiding. 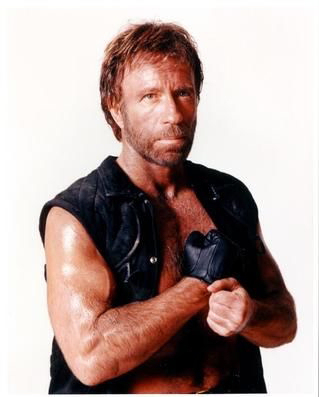 10> Chuck Norris is so fast, he can run around the world and punch himself in the back of the head. "I have a million more Chuck Norris jokes... my husband comes home from work ant tells me all of these"